Blossom Beauty is an elegantly designed free WordPress theme helpful to create a beautiful blog for aspiring female bloggers. This theme features a fully responsive design, Speed and SEO optimized code, and easily customizable features to help you create a wonderful blog without writing a single line of code. The stunning and intuitive design of this theme helps you increase the visitors’ engagement on your website. With Blossom Beauty theme, you can create an eye-catching and gorgeous beauty and fashion blog without investing a single penny. 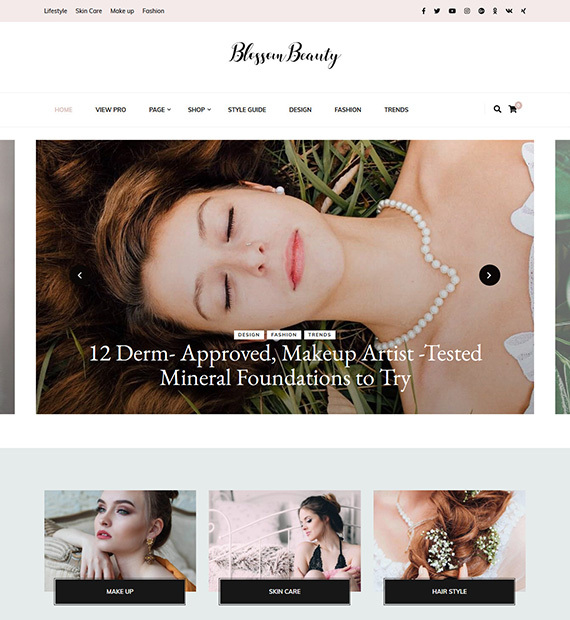 This theme is fully compatible with the WooCommerce plugin and allows you to sell beauty and fashion products via your blog. Get more user interactions and followers to your Instagram account as well. Simply integrate your Instagram onto your website with a click. 404 error with your site? Don’t worry the theme comes with a built-in 404 Error page that lets your user know about the error that occurred.